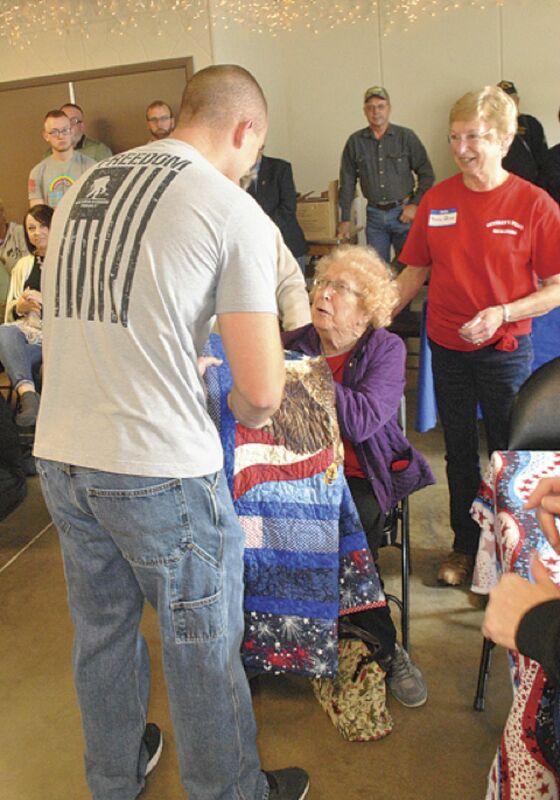 AIR FORCE VETERAN Tony Kurimski receives a quilt from the oldest Peace Quilter, Barbara Shelquist. A concert by perhaps the world’s greatest living opera star, Centerville native Simon Estes, may have been the biggest story of the year, let alone the last three months. The announcement of a new factory coming to Albia (Camp 365) and the hospital’s ground-breaking of a $19.5 million building project were two other big stories in the final three months of 2018. A Republican landslide in rural Iowa (including Monroe County) elected Kim Reynolds governor and kept control of the statehouse in GOP hands. The campaign for House District 80 gets ugly when an inaccurate Facebook post gets Republican candidate Holly Brink hopping mad. A total of 23 students from Albia Community High School gather at Lake Miami Park to plant 44 new trees to replace those killed by Emerald Ash Borer disease. After a heart attack and quadruple by-pass surgery, Dr. Neal Sokol returns to Monroe County Hospital to continue his practice as general surgeon. Nicole Moore and Chariton Valley Planning and Development become the county’s zoning administrator. The Albia City Council temporarily suspends part of an ordinance that keeps anyone 21 years old and younger out of any bar or place where alcohol is served. Monroe County Hospital and Clinics breaks ground for their $19.5 million renovation and expansion. The Albia school enrollment numbers come in with a loss of just two students. Albia native Ben Hoskins plays a key role in building a huge pipe organ in New York City. The Monroe County Conservation Board offers to lease the Monroe County Sports Complex to the Albia Community School District for $1 in exchange for the school’s management and future investments. Long-time Monroe County Chief Deputy Ken Hollingsworth announces his retirement from the force. 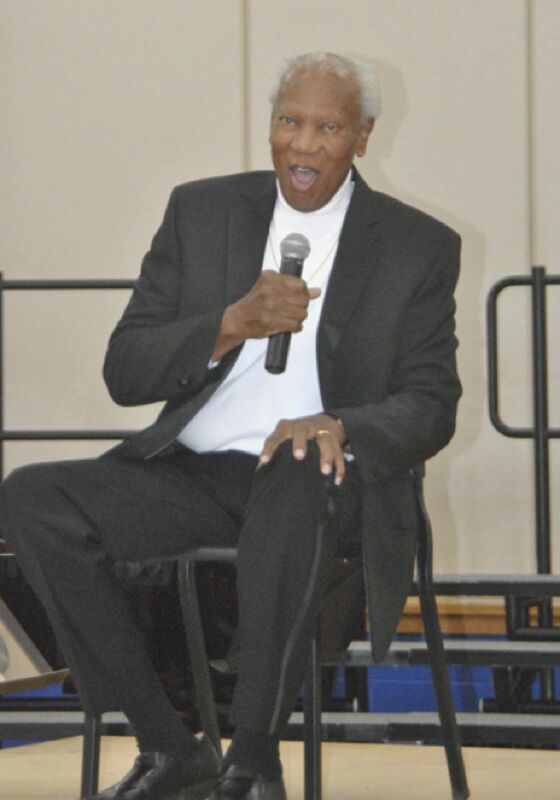 Simon Estes performs in concert at Albia Community High School. Monroe County Hospital and Clinics board votes narrowly to allow the Davis County Hospital to share its CEO Veronic Fuhs. The Albia FFA Chapter sponsors “Feed the Farmer Day” at the Smith Fertilizer and Grain plant. Three members of the Albia FFA receive their American Farmer Degrees at the national FFA convention including Hannah Curry, Michaleah Stewart and Zach Briggs. Denny Amoss, John Ballard and Scott Kelly line up in a battle for county supervisor. Julia Selby is named to the Opus Honor Choir as a fifth grader. Lathrop Farms set a 17,000 rock on the Monroe County Courthouse lawn in preparation for the painting of a Freedom Rock. The Albia Industrial Development Corp. announces that a new factory Camp 365 will be relocating to Albia and the south industrial park beginning in the spring of 2019. The Minneapolis area company manufactures high end niche fold up campers and hopes to employ up to 150 people. Monty and Linda Heller’s purebred POA “Sophie” finishes fourth and fifth in two nationwide horse shows. The Albia Peace Quilters honor 94 more veterans serving from 1975 to the present. Albia Lincoln Center organizes a huge celebration to honor veterans for Veteran’s Day. ACHS drama puts on “Hello Dolly” for three sold out crowds at the King Opera House. Republicans dominate another election in South Central Iowa. Holly Brink (House District 80) and Denny Amoss (Monroe County Supervisor) win in landslide victories. Albia police and fire department ask citizens to help find out who is setting fires in town. Chief Deputy Ken Hollingsworth, a 30-year veteran of the Monroe County Sheriff’s office is retiring. The Albia Community School District discusses the offer to take over the Monroe County Sports Complex from the Monroe County Conservation Board. There is clearly some sticker shock when the Albia School Board hears a report from an engineering firm hired to determine what projects need to be done to keep up school buildings. The price tag ranges from $11 million to $17 million. Fired Monroe County Zoning Administrator Juanita Murphy asks the board of supervisors to return her to her former position with back pay. The Albia City Council decides to make parking on the north side of Fourth Avenue East illegal. Southern Iowa is pounded by an enormous November snowstorm. Albia receives about 15 inches of snow in just over seven hours. A steady all-day rain doesn’t dampen the Victorian Stroll with lots of people ducking in and out of stores to avoid the rain. The school district decides not to offer an early retirement package for staff in the spring. The Monroe County Compensation Board goes back and forth with the board of supervisors over proposed county official’s raises. A lost and still incomplete Comprehensive Plan is found by Supervisor Denny Amoss, saving the county over $50,000. Rep. Dave Loebsack makes a visit to Monroe County Hospital and Clinics. The Albia Fire Department earns a #4 rating, an achievement the department has been working on for over 20 years. The Albia Newspaper is victim to a bogus bomb threaten, forcing them to evacuate the building. Unemployment in Iowa and in Monroe County hits historic lows.